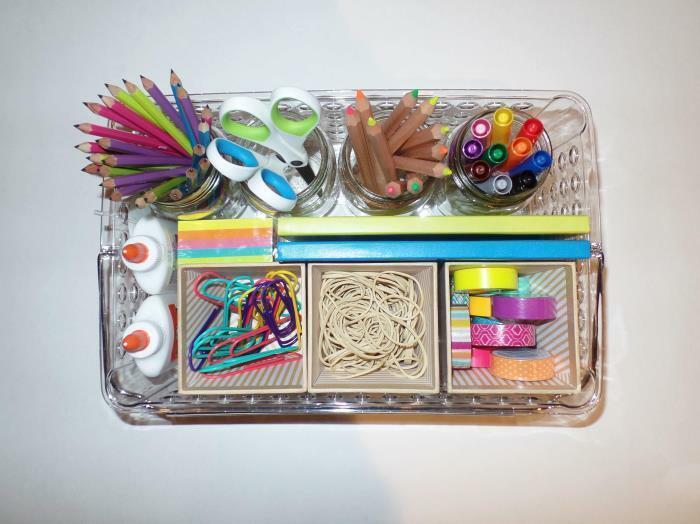 Wouldn’t it be great if all your kid’s school and craft supplies were in one single spot, ready and organized to use? I just love the idea of a caddy turned into an organizer. It’s portable and the perfect size. The problem I always have is that things always seem to get jumbled up and don’t stay the way I organized them. My solution – VELCRO® Brand fasteners! 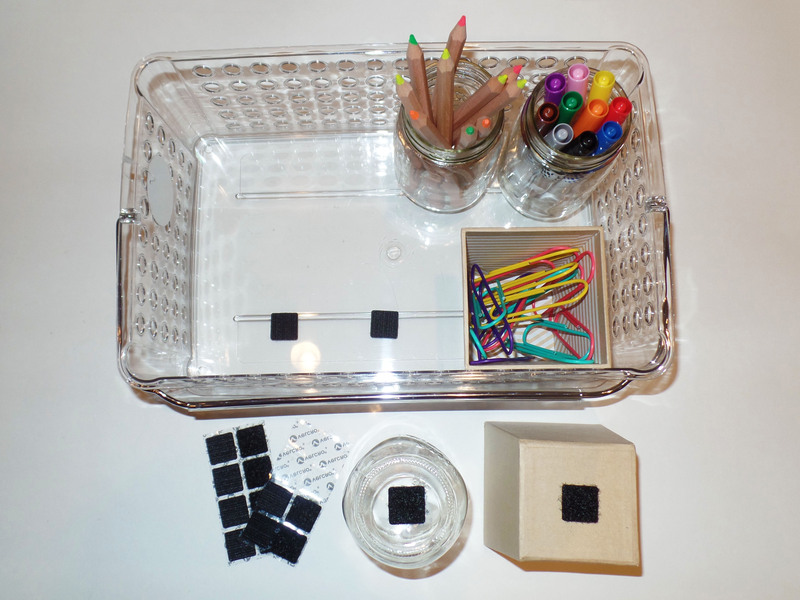 I organized my caddy using masons jars and stationary cups and attached them to the base of the caddy using VELCRO® Brand Sticky Back fasteners to keep them in place. But the best part is that I can still remove the jars when I need to! Decide on an arrangement of jars or cups within the caddy. I used a combination of mason jars and stationary cups for variation. Once you have your arrangement, peel the Sticky Back fastener off the acetate and stick onto the bottom of your jar or cup. Stick the opposite Sticky Back fastener square to the caddy base where your jar or cup will sit. Continue this process for the remainder of your cups or jars. 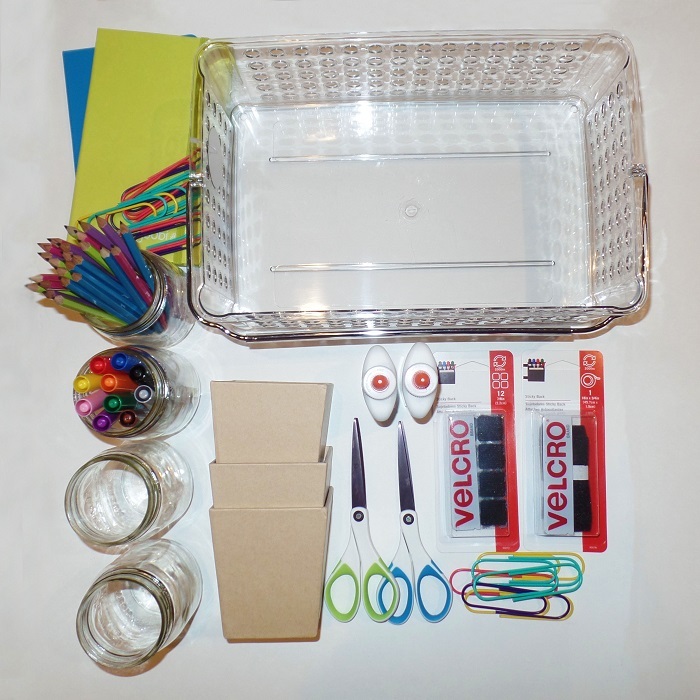 Organize and fill the caddy with stationary, art supplies, etc. Be sure to check out the wide array of VELCRO® Brand products available that will make your life easier. They’re designed to do all the work and all you have to do is put them in place. Also, check out our latest “Classroom Makeover” contest, to help celebrate Teacher Appreciation Week 2015 (May 4th – 8th)! To enter, all you have to do is tell us a little bit about the nominated teacher and upload a photo of your classroom. We can’t wait to hear your story.